Late Sunday night, feeling a little defeated, having called half a dozen tree services, I googled emergency tree removal service and our location and got this. 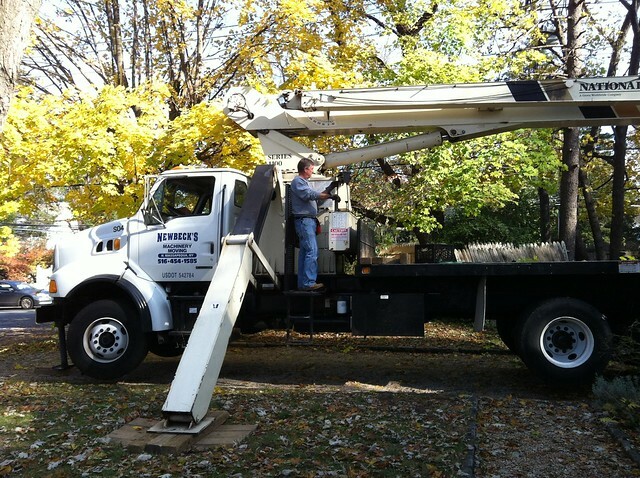 I figured it must have been a google error until I poked around and found out that Tim Waterman, arborist-extraordinaire drove cross country to do tree removal work in my area. He and his brother-in-law came by the house, in the dark, exhausted from a long day of work and gave us an estimate that knocked us out. There was no way we could afford him. We sent him off and I began to worry again about K taking down that tree. About an hour later Tim called, I don't want your husband up on that roof, he said and slashed his price nearly in half. I told him I'd think about it and call him in the morning. The next morning, it took K about four hours to drop a much smaller maple tree that was cracked and endangering our car. The chainsaw was smoking, he was exhausted. Middle and I watched with great anxiety and when he was done he told me I could call Tim. They were just down the road. They brought a gigantic crane. They talked for a long long time about how to do what they needed to do. They put the crane in the driveway and put down outriggers. The crane was huge. The tree was huge. It was a complex and delicate operation to lift the tree off the roof, slice it where it had cracked, swing it gently around, lower it to the ground and start cutting. They were the nicest guys in the world. They were amazing professionals. They allowed us to pay what we could afford (and I am certain, with the destruction in my town, that they are doing very well). The tree weighed 3300 pounds. Just a couple of hundred pounds shy of the maximum they could lift. While we all know K is capable of just about anything, 3300 pounds was just slightly above his limits. This is the new view out my living room windows. Do you have a fireplace? 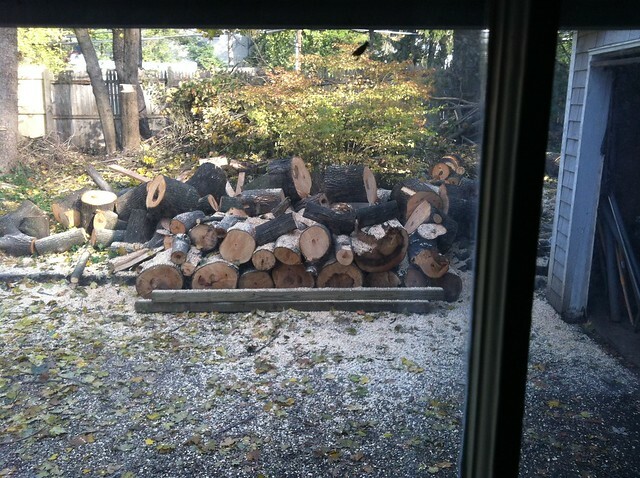 Free firewood...although doesn't it have to sit for a year? Yes, it has to sit, but yeah. Looks like a cord or two! Never mind me, I figured it out. Yay Flipboard. PS What lovely tree guys. It must be quite a relief to have that off the roof and I have no doubt that K has been left with plenty of work to do in the wake of it's removal. I'm sorry but Tim's website is hilarious. Hooray for nice people who help other nice people!!!! OH what a blessing for your family! And having a husband who has hacked down ginormous trees in the relative safety of the woods, I know how scary that job really is. Cannot imagine working that out by a house. I can't believe there are still people like these. People who will understand and HELP. You write so beautifully. Wow. Hooray for Tim, and K too. All I can say is WHEW. Thanks for keeping my friend and her family safe. I could hear you exhaling from here. Although I'd regard that last comment as spam, I do believe in supporting tree removal specialists. It's great work they do. Obviously, I have invited robots.